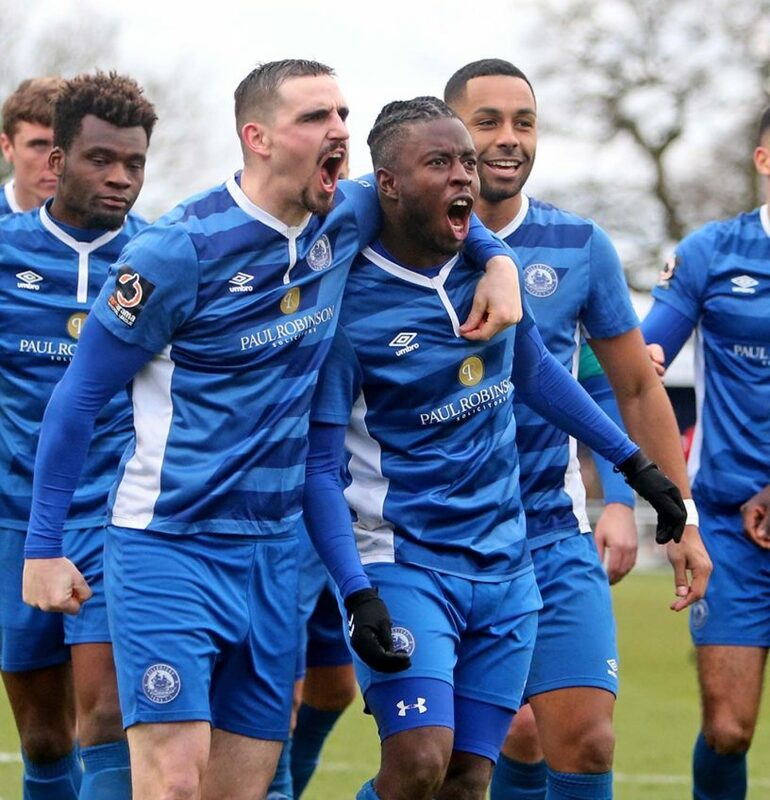 Billericay Town roared back to form at the AGP with a convincing 2-0 win against promotion rivals Welling United. Resurrected by the second coming of manager, Harry Wheeler, the Blues had to wait until the second half to make the break-through against an obdurate Wings side. Goals from the lively Kieron Cadogan and prolific striker, Adam Coombes, who struck against his former employer, sealed the victory. Billericay Town leapfrog Welling to climb to 5th position in the league table. On a blustery January afternoon, the Billericay faithful were treated to their first sight of the returning Wheeler back at the helm. Having endured a chastening experience during his ill-fated 15 games tenure at Maidstone, it was handshakes and smiles all-round for the man brought back to restore stability. With the past twelve months containing the highs of a treble win, and lows of departing managerial jobs twice, Wheeler returns a wiser and more experienced manager. With “the band back together” including assistant manager, Jamie O’Hara, showing great enthusiasm in his new position, Blues favourite Danny Hazle back on the coaching staff, and recent arrival of sports science specialist, Craig Lewis, the bench had a reassuring presence. Any Billericay team put together by Wheeler is hard to beat and selection had a resilient look to it with a 4-2-3-1 formation favoured. With four changes to the line-up versus Concord, in came the previously suspended Ross Lafayette up front and midfielder, Danny Waldren. Wide-man, Cadogan, started and, new signing, Charlie Wassmer, made his debut in the centre of defence. Welling also made four changes to their starting line-up with the height and directness of 6 foot 4 inch striker, Danny Mills, preferred to new Barnet loanee, Jack Barham. Back from injury came right back Jordan Gibbons and midfielder, Julien Anau. Conscious of not being outnumbered in central midfield, and keen to better a number of poor results away from home, Wings boss, Steve King made a switch to a three man defence. Ex-Dulwich Hamlet man, Anthony Acheampong returned as the extra centre back to reprise his role versus Dartford on New Years Day. Gibbons and former Claret Craig Braham-Barrett operated in advanced wing back roles. With two well-matched sides set up not to concede the initiative, the game understandably began cagily. With few openings, the best Welling chance saw central defender Joshua Hill head narrowly wide from a 4th minute corner and Billericay’s Cadogan have a shot diverted into the side netting by an alert Wings defence. The away side impressed in the early stages on the left hand side where the speed of Braham-Barrett was well utilised. With Brendan Kiernan providing support, Welling took every opportunity to advance. Blues right back, Joe Kizzi, restored to his usual position, showed his excellent turn of pace to counter early Welling incursions. 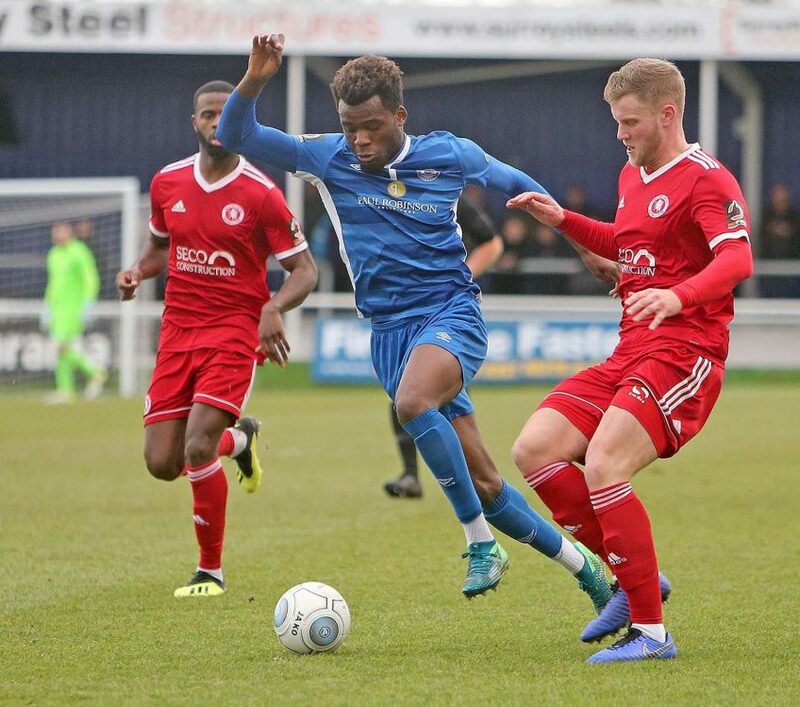 Joining Billericay Town in mid-January from Maidstone United, Michee Efete has delivered in every appearance for the club and continued to make a favourable impression in the unfamiliar role of left back. Displaying his core attributes of speed, willingness to get forward, and a talent for beating his man, Efete troubled the Wings defence with an early run forward. Stopped illegally by Gibbons, who incurred the first yellow card of the match in the 16th minute, the resulting free-kick would lead to the home side’s best early chance. Adam Coombes served up a trademark swerving exocet strike that could not be held by Welling goalkeeper, Dan Wilkes. Rebounding out, Cadogan’s initial shot was blocked, and the ball fell to new boy Wassmer who could only fire over the bar when well placed. In his own half of the pitch, Wassmer was a revelation and turned in a commanding performance at the heart of the Billericay defence that made light of only joining the squad on Friday. A physical presence throughout, and notably cool in playing the ball around, he will excite Billericay fans in coming weeks. Voted in the National South team of last season during his time at Hampton & Richmond, Wassmer was hand picked by departing Beavers’ manager, Alan Dowson, to be the centre piece of his new defence at Woking. Unfortunately, injury devastated the first half of his season and, with the position at Woking filled by others, he joined up with Wheeler at Maidstone in December. Now available on loan until the end of May, his acquisition by Billericay appears to be a very clever piece of business. His impact in revitalising a defence that has been regularly breached in recent matches, and had an obvious weakness defending set pieces, was clear to see. With Blues showing a hitherto forgotten level of organisation and team shape, Wheeler’s influence was clearly shining through. Set up to be difficult to beat, the balance of providing adequate support on a timely basis to lone front man, Coombes, was tricky to achieve. Kizzi’s strong runs forward on the right hand side, and good quality crosses into the Welling penalty area, were often short of enough targets to count. With a run of goals to reassure and breed confidence, Coombes applied himself dutifully to his task and never stopped running. As the match progressed, this aspect improved with Lafayette pushed further forward after half time. Welling remained dangerous and was quick to take advantage of the Blues over-committing at a corner to break quickly. With the tricky Kiernan showing a turn of pace to advance threateningly, Moses Emmanuel was forced into a desperate, lunging tackle to bring down the Wings player around 30 yards from goal. Incurring a deserved 37th minute yellow card, Emmanuel will have deemed it a worthy sacrifice to avert danger after Bradley Goldberg’s free kick came to nothing. 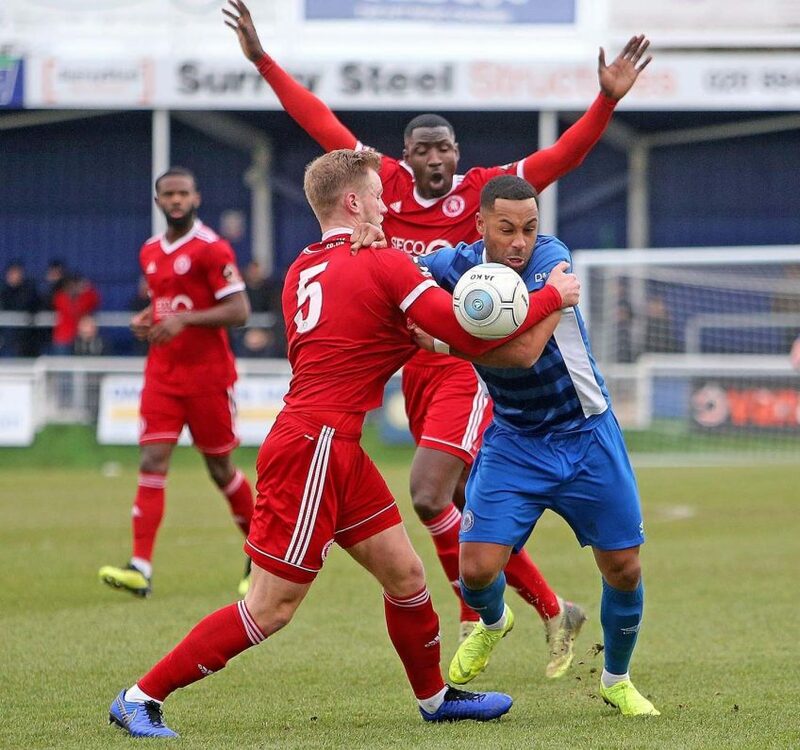 With Welling skipper David Ijala and Julien Anau both busy in central midfield, and Blues’ pairing of Jake Howells and Waldren fully occupied, the match remained well balanced. The closing minutes of the half saw the most significant action. Firstly, Welling’s Mills escaped into the penalty area and was on the point of shooting when a last ditch tackle by Wassmer saved the day. The intervention saw danger averted as a corner was awarded. Two minutes later, Welling’s Hill, already on a yellow card, committed another foul and had the referee reaching for his notebook. Remembering that the centre-back had previously been cautioned, the official relented and limited himself to giving the player a stern warning. Lucky to escape a sending off, Hill was substituted by his manager mid-way through the second half as attacking changes were made to seek to retrieve the game. Billericay started the second half with renewed vigour and took the lead in the 48th minute. The excellent Kizzi briefly turned his back on school-teaching to become an architect as his clever run to exploit space on the right hand side saw him beat Goldberg on the outside and deliver a superb pass into the Welling penalty area. In space, and back to goal, Cadogan latched onto the ball, span round to get a sight of the target, and dispatched a measured curling left foot shot in to the far corner beyond the sprawling, Wilkes. Visibly stung by going behind, Welling responded with further good work on the left hand side from Braham-Barrett and, leading scorer, Kiernan was a threat throughout with his dribbling and quick passing. Producing an effective end product remained a challenge for Welling as shots on target remained at a premium. Light in attacking areas, recent budget cuts have seen influential striker Matt Paterson depart and a New Years Day hamstring injury continues to claim enterprising winger, Nassim L’Ghoul. Against a well marshalled Billericay defensive unit, the best the visitors could muster was a 56th minute shot on the turn from Goldberg that rolled wide of the far post. Out for the season injured, ex-Arsenal attacking midfielder, Jack Jebb, and so inventive from set pieces is also a major miss for this Welling side. The home side went further ahead in the 60th minute as the immutable law of the ex-player kicked in and Coombes kept his fine scoring run going with his 8th goal in nine games. Amazingly, home manager, Wheeler, played a role ordering Kizzi from the touchline to throw the ball to Emmanuel in space on the right side. Duly honouring the boss’s wishes, the ball arrived at Emmanuel’s feet. He decided that the time to audition for the job of tricky winger had come. Showing impressive skill, the front man turned his marker inside out and delivered a peach of a cross that saw Coombes head powerfully into the net. Seeking to adopt his usual nonchalant goal celebration, Coombes was undone by Wassmer who upped the tempo considerably with an enthusiastic jump onto his back as he gleefully kick-started celebrations. Wassmer almost had a goal of his own to celebrate in the 62nd minute as he rose to head a Waldren cross against the Welling cross bar. Cannoning out to Lafayette, his finish was fumbled by the goalkeeper and only just scrambled out before the entirety of the ball crossed the line. With the match seemingly under control, Billericay made several substitutions, with Alfie Potter who entered in place of Cadogan delivering an eye catching 25 minutes spell. Looking a threat throughout, he thrived in a midfield role, contributing well with a series of attacking forward runs against an away side that were committed to getting back into the game. Potter’s best moment came in the 80th minute when he broke quickly and played a delightful lofted pass to Emmanuel inside the Welling penalty area. Unselfishly, the front man squared the ball for the onrushing Connor Smith. With the goal gaping, Smith, who had scored a wonderful long-range effort against Concord the week previously, could only hit his shot over the bar. The miss was not costly and despite six additional minutes, there were no further additions to the score. 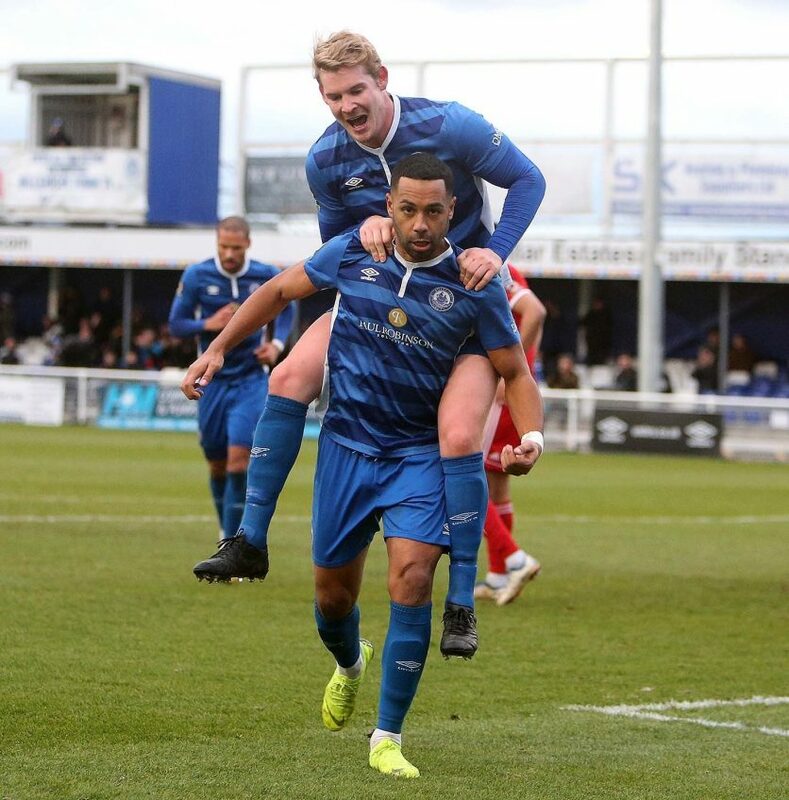 With Billericay recording their first home win in the League since victory over East Thurrock on 30th October, the return to form, and the bonus of a clean sheet, builds confidence that the club’s league campaign can be revived. 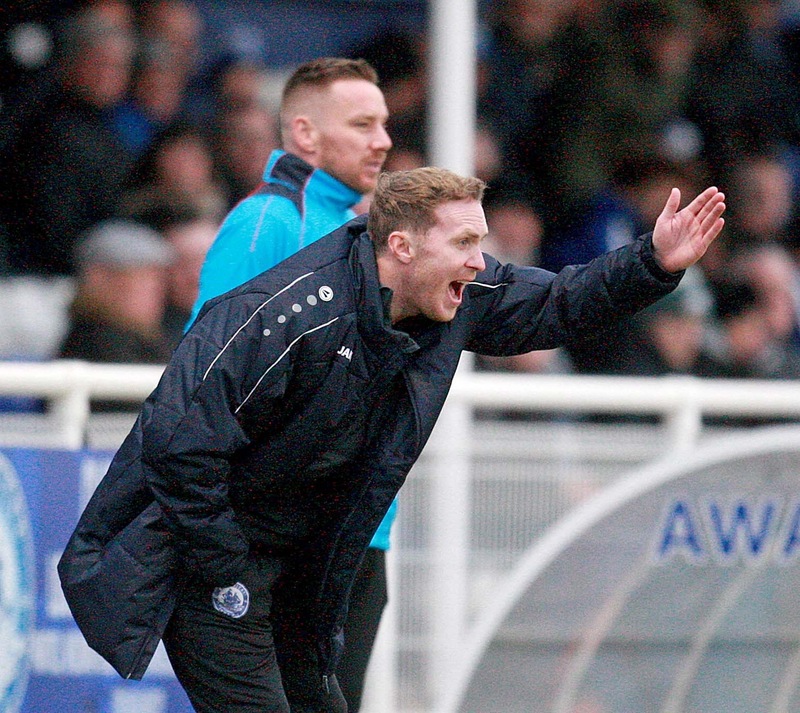 With a clear pattern, shape, and cohesion throughout the team, Billericay look a different side to the one that has turned out in recent weeks and, whilst early days, the appointment of the new management team appears to be a “game-changer”. As we all know, things never seem to stay the same at the club. For now, the team look to be sailing with the right captain who, should he be left to chart his own course, should arrive at the correct destination. Subs Not Used: 6. Sam Deering 13. Mark Smith, GK 14. Charlie Wassmer – A colossus at the back, he provided much needed experience and stability to the back-line. Composed on the ball and able to build attacks, he also snuffed out danger with his strong aerial ability. A last ditch tackle on Mills probably stopped Welling scoring and rattled the crossbar himself in the opposition box. Brendan Kiernan – Involved in most of the Welling attacking play, his dribbling and clever passes caused the Blues defence problems on what was a relatively comfortable afternoon. Unfortunate to be fouled leading a dangerous counter, Kiernan never stopped running and combined well with Braham-Barrett.